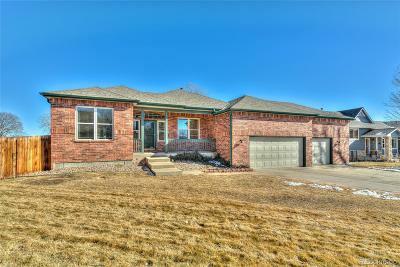 4638 Fig Street Golden, CO. | MLS# 3514779 | Tri-County Associates: Broomfield, Westminster Residential Real Estate. Beautifully updated, this Ranch style home is located in the highly sought after Golden community of the Orchard. The expansive floor plan offers convenient main level living to include a private study with wood floors overlooking the covered front porch, Living and Dining rooms with wood flooring leading to the spacious eat-in kitchen with built-in island, granite counters, S/S appliances, double ovens & gourmet pot rack. Easy maintenance tile flooring fills the kitchen and family room area where you can warm up by the gas log fireplace in winter or step out to the 550 square foot deck to enjoy the huge backyard. There are 3 bedrooms, the Master includes its own private bath with jetted tub and a huge walk in closet, plus another full & 1/2 bath, and main level laundry. Downstairs is the enormous finished basement with bar & kitchen area for you to spread out and the 4th bathroom. Enjoy a newly installed roof, gutters, high efficiency furnace and 2 hot water heaters.